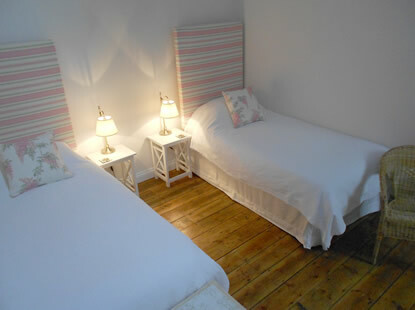 We offer two double bedrooms with king sized beds and one twin bedded room. 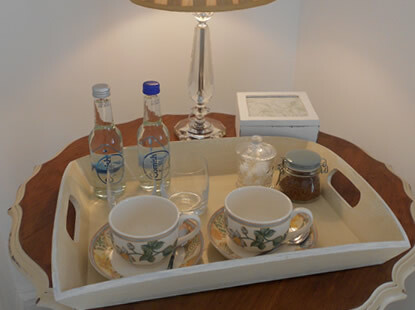 All three rooms have new and contemporary en-suite facilities and are individually decorated in a simple but stylish manner offering comfort and character. All our rooms are non smoking. 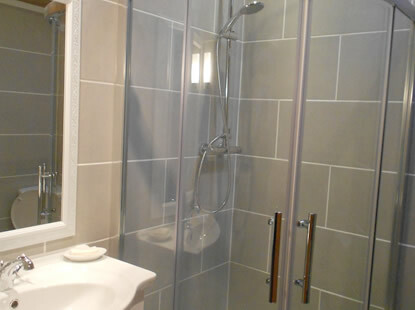 Fully en-suite private bathrooms with shower. Quality mattresses, duvets and pillows. Remote control digital flat screen TV. Easy to control radiators and towel rails. Power supply plug adaptor for non-UK visitors. Unfortunately, because of the age and layout of the house we are unable to provide access for wheelchairs, and would recommend that if you are at all concerned about access and mobility it would be best to call us in advance. Click here to download our detailed access statement (PDF). For those wishing to enjoy a cycling or golfing break, we can offer secure storage and cleaning facilities for your equipment. Unfortunately, we are unable to accept pets at this time. Located between the courtyard and the babbling brook is the largest bedroom. 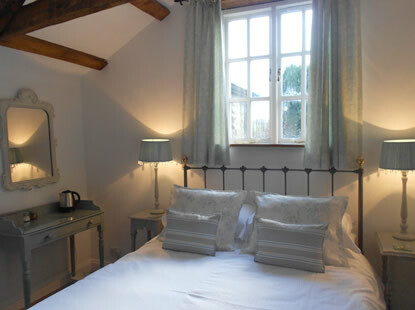 Created in the old forge, the bedroom is accessed through double Georgian style doors which provide wonderful views of the brook and gardens beyond. 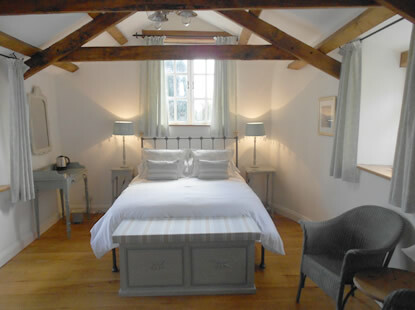 A large and inviting king sized bed compliments a most spacious room with exposed beams and oak flooring. 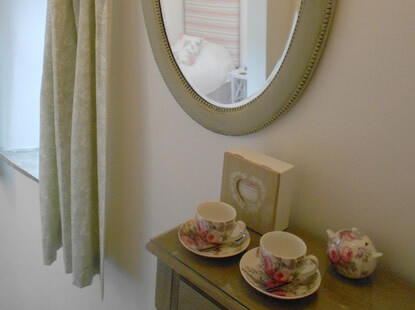 The room is warm and inviting with a décor that is in a country style with creams and greens complimenting the woodwork. 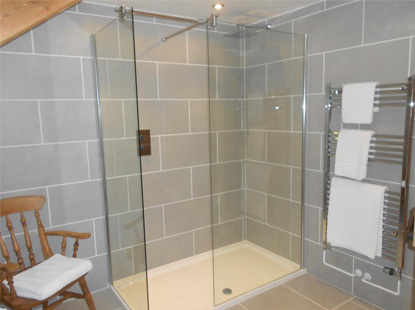 A large en-suite provides ample space for a large walk-in shower, toilet, hand basin, heated towel rail, complimentary toiletries and plenty of space to pamper oneself. Located alongside the brook, Trispen was created from the former 19th century wood store. Access to this room is from the small hallway that provides access to the dining/sitting room. 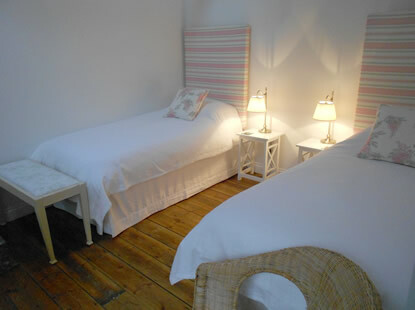 This triple aspect room has been tastefully renovated to a high standard. 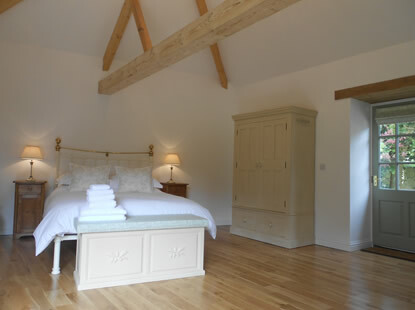 An inviting king sized Victorian style bed is complemented by oak beams and wooden flooring. 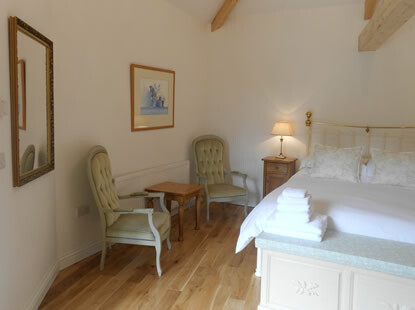 The room is decorated in duck egg blue and white tones with country style furnishings. 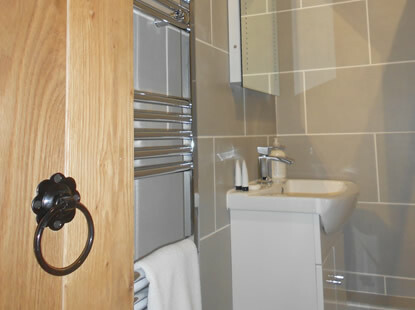 The en-suite bathroom has a large built in shower cubicle, toilet, hand basin, heated towel rail and complimentary toiletries. 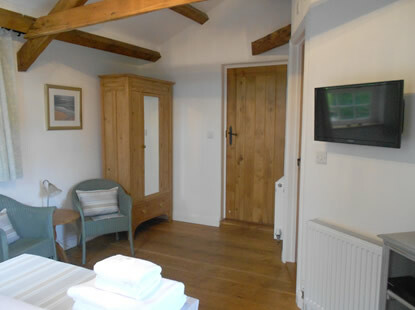 The twin bedroom has been created from the old saw room and is accessed from the brook side. 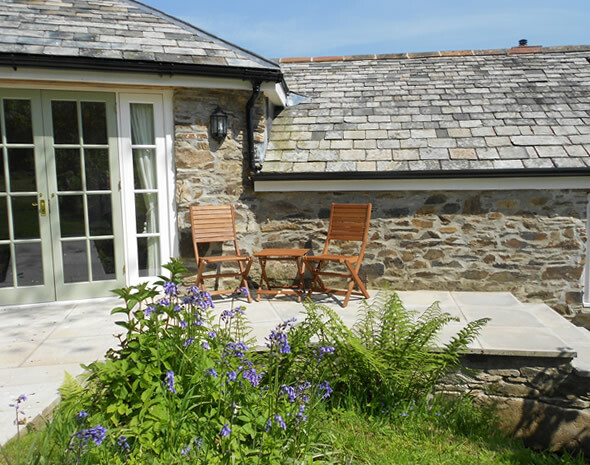 The room is on two levels with three granite steps leading up to a small landing giving access to the en-suite. High ceilings and wood flooring complement a room decorated in subtle greens, pink and white. The windows provide views over the brook and gardens beyond. 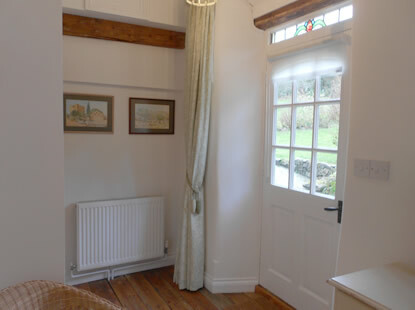 This room also has internal access to the small hallway leading to the dining/sitting room. The contemporary en-suite bathroom has a large walk in shower, toilet, hand basin, heated towel rail and complimentary toiletries. 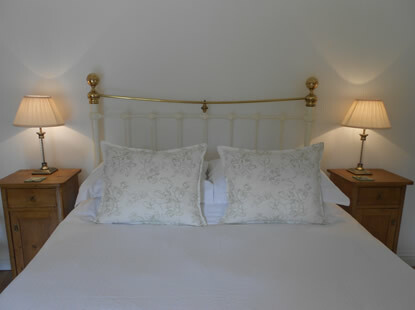 The twin beds can be joined to provide an ample double bed should this be required. 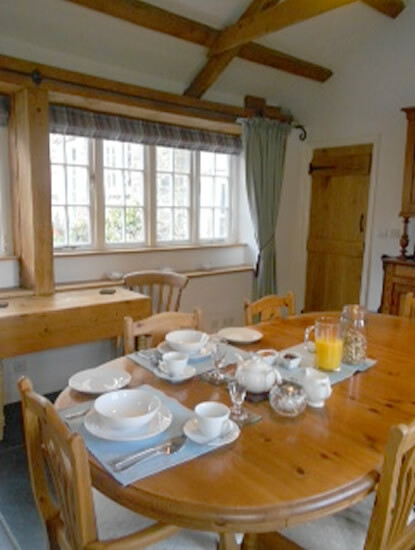 After a restful night in the peaceful hamlet, your day will start with a delicious home cooked breakfast. Much of the produce is sourced within the village or locally. Also available are a selection of cereals, fresh fruit, yoghurts and preserves for those looking for a lighter start to the day. 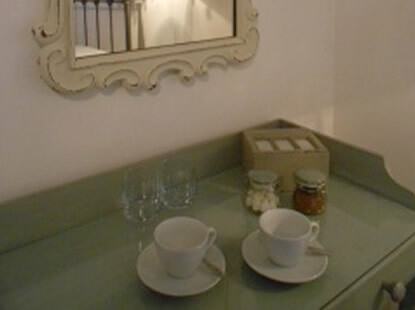 A continental breakfast or pastries are also offered as an option if notified on arrival. On warm summer mornings there is the opportunity of a leisurely breakfast in the warmth of a sunlit courtyard. We are very happy to serve a mouth watering cold deli platter in the evening for our guests provided that we receive a request in advance. Unfortunately, we are not licensed and so we are unable to offer any alcohol. You are welcome to bring your own drink. We are very happy to provide packed lunches following a request in advance. Using local ingredients whenever possible, all our sandwiches and rolls are freshly made and rest assured, we will endeavour to produce your favourite filling.